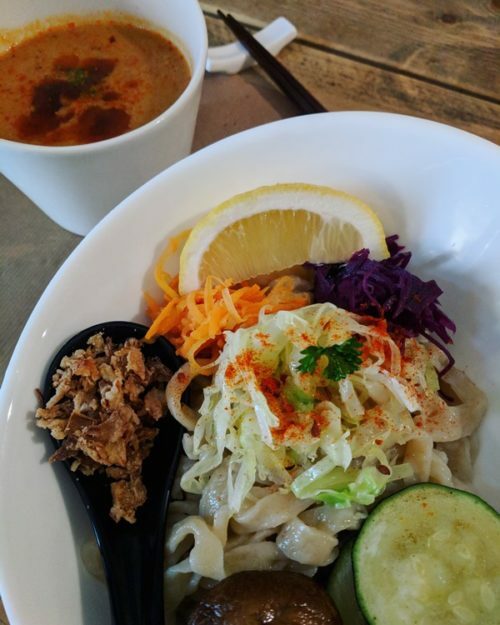 Amsterdam restaurant review: Vegan ramen - (Men) Impossible?! Think of ramen, and you likely think of the thick porcine bone stock of tonkotsu, or the medicinal richness of chicken broth. 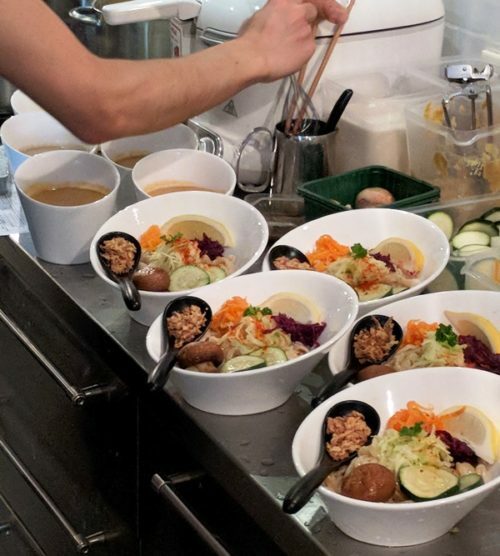 Plus, of course, there’s the toppings: silky yellow egg yolks, still soft in their boiled whites; the porchetta-like depth of flavour of char siu; perhaps some meatballs… I doubt your imagination floats in the direction of vegan noodle soup. At least mine didn’t. But what with Vegetarian January in full swing again this year, and given that I get a ramen craving at least once a fortnight, I clearly needed to find an alternative to my tonkotsu addiction. Enter Men Impossible: a communal-dining experience in the Jordaan, at which for €25 you can eat your fill of vegan ramen plus a veggie starter, drink and tea. I tried their yuzu beer, which had barely a hint of yuzu but was just a really nice Japanese beer. Light and fruity and not too bitter. 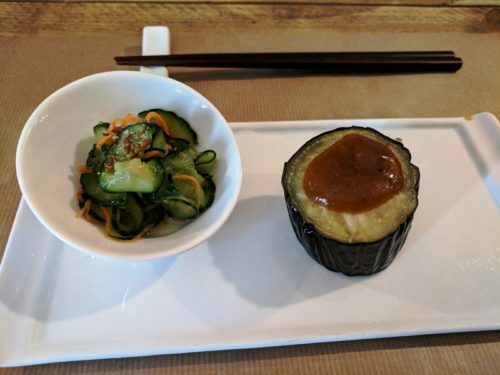 At the same time, I tucked into my starter of aubergine topped with a sweet miso dressing. The flavour was good, but the aubergine was a tad undercooked, and the whole thing was, well, tiny. But cracking on with the main event: the Red Dragon Ramen. These are tsukemen – dipping ramen – the noodles hand-rolled, and the broth a thick, umami-rich, spicy, miso- and tomato-based soup. I must admit the noodles had an extremely satisfying bite and the soup was very generous in flavour, despite the lack of animal products. It also came with some shredded vegetables (raw carrot and red cabbage), cooked courgette, crispy fried onions, and a mushroom that I steered well clear of. Better still was the accompanying spoonful of black garlic oil that added an extra depth and savoury note to the whole dish. We skipped the tea on offer in favour of heading back into the grachten for a cocktail at Tess Posthumus’s new venture: Flying Dutchman. But with or without tea, €25 seems like rather a lot for a bowl of soup, a slice of aubergine and a beer – albeit they were pretty well done. I doubt Men Impossible will be replacing my ramen fix once Vegetarian January is over, but for now I’m happy to have found out that vegan ramen is – after all – possible. 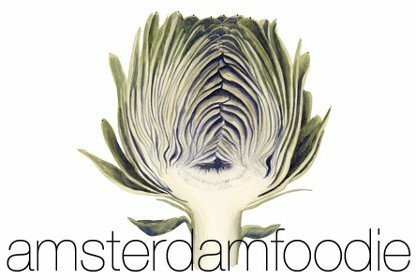 And I expect many other vegan, vegetarian or flexitarian Amsterdammers will be too.